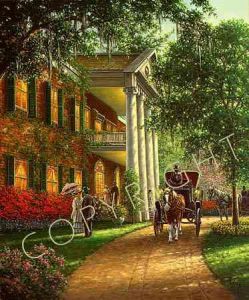 America's South has long been recognized for its fine plantation homes and genuine hospitality. On this evening in the not-too-distant past, the clatter of horse-drawn carriages announced the arrival of guests to enjoy the company of their friends and neighbors. It was an innocent time, a time of warm conversation, congenial souls, and extravagant dinner parties. The aroma of azaleas and rich southern cuisine permeated the air. A truly romantic evening filled with the finer things of life, today we call it "Southern Charm."